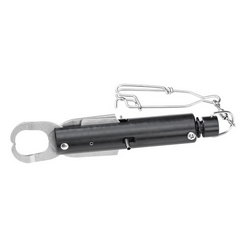 The SeaQualizer Fish Descender is a jaw clamp that is designed to release automatically at a pre-specified depth. It has three depth setting (50'/100'/150') to choose from in order to acheive recompression and release the fish at the correct depth to prevent barotrauma. This clamp does not require any tugging to release and allows for multiple SeaQualizers to be attached to a single line. Meets ODFW requirements for mandatory descending devices.